UPDATED: APR 5, 2019 (Cask at St. Urhos Pub, 20190405) The beer poured golden and rather cloudy. Its head was medium sized, white and it lasted long. Aroma had fruitiness, pine, citricness and creamy toffee. Palate was medium bodied with medium carbonation. Flavours were fruitiness, pine, malts and bitterness. Aftertaste was hoppy and bitter. A tasty and clean hoppy brew with pleasant aftertaste that lasted long. UPDATED: MAR 30, 2019 Cask at Angleterre, Helsinki. Color is cloudy golden with medium white head. Aromas and flavors: Fruits, floral elements, hops and malts. Very good. 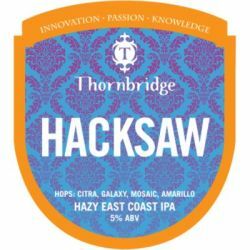 UPDATED: FEB 10, 2019 Cask at the Junctiin, Harborne. Pours murky light gold with small head. Aroma is sweet straw and sherbet. Taste has hoppy straw and stone fruit to start with a sherbet lemon finish. UPDATED: DEC 23, 2018 [email protected], London, with the Malmö crew - golden orange hazy pour with a white head. Juicy fruity with sweet fruity notes of grapefruit, tangerine, mango, medium body, piney hoppy hits into the finish. Nice. UPDATED: DEC 16, 2018 Cask at CBC, Covent Garden on 16th December 2018. Hazy amber with shallow foam and spot lacing.a fruity, citrus aroma. Tropical and citrus fruits in-mouth, and a tangy citrus finish with a savoury background nuttiness. Medium bodied with a smooth mouthfeel. Cask at GBBF '18, day 2, 08/08/18. Hazed golden blonde with a decent off white covering. Nose is grassy, melon, juicy hop aroma, citric tinged straw. Taste comprises orange pith, cantaloupe melon, straw, light breads, airy malts. Medium bodied, soft carbonation, semidrying close kissed with balanced juicy hop bitterness. Solid cask sessioner.